Summer is just around the corner and after a long school year, I feel like this is the perfect way to celebrate! I typically only offer mini sessions during the fall, but this fun concept demanded it and I can’t wait to get technicolor with you. I will provide colored powder and silly string- all you need to do is show up! The colored powder is non-toxic and will wash out of clothing. That being said, you might not want to wear the fanciest thing in your closet. These are quick, fun sessions that major on candid fun and lifestyle photos. If you’d like more formal photos- sign up for my mini-sessions in the fall! We will be shooting outdoors in a park-type setting, weather permitting. If weather doesn’t allow us to shoot, we will reschedule for another date. 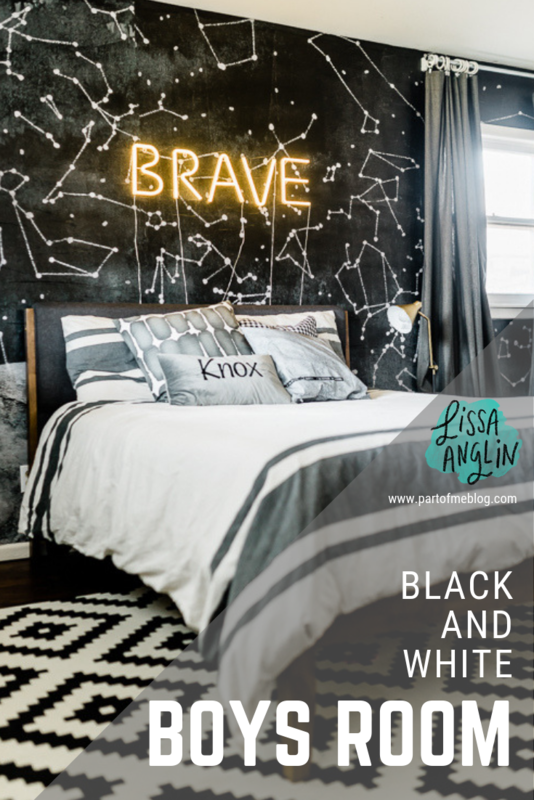 There are lots of different ways you could style your family- in all black or white, or all COLOR! Neons could be fun as well. This session can be for couples or kids only, but is ideal when the whole family gets in on the fun. Photos will be delivered via digital download from a private online gallery about 2 weeks after your session. Because of the nature of these sessions, spots are limited and are first-come, first-served. To request a spot, please fill out the form below and I will respond ASAP. You will be sent an email invoice for the session and your spot will be officially booked once the invoice is paid. Please select and I will do my best to give you the time you prefer. Anything else you'd like to ask/tell me? Thank you so much! Can’t wait to get technicolor with you! I have been professional photographer for over 13 years now, and in that time, I feel like I’ve done literally everything there is to do. Until a couple of weeks ago- when I felt the need to put together this rainbow of a session. 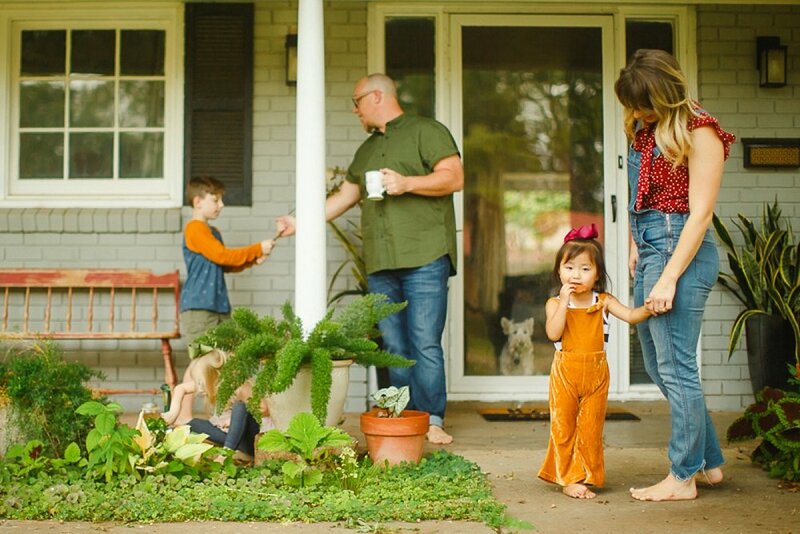 I have had the honor of photographing this sweet family for all of those 13 years, and have literally watched their babies grow! So, when I had this idea for a crazy fun session, I knew who to call. Jessica has done my hair for over a decade as well- and I am so glad she’s there to tame my mane and make me look cooler than I really am. :) If you are needing a great stylist in Lubbock, I highly recommend her salon! I wanted to capture spontaneous fun and real smiles. Candid photos with no stiff smiling- and of course, lots of COLOR! I think we achieved all that and more. 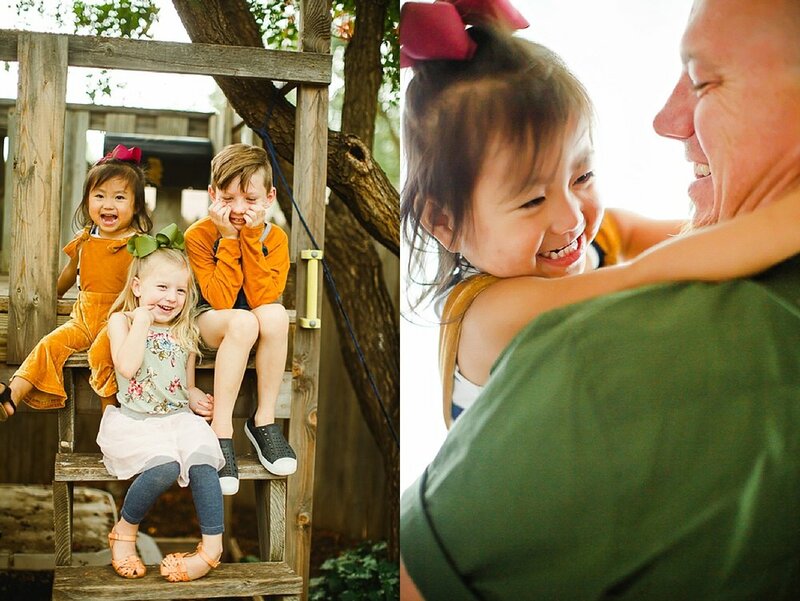 These are definitely some fun family portraits, and ones unlike we have ever shot before. 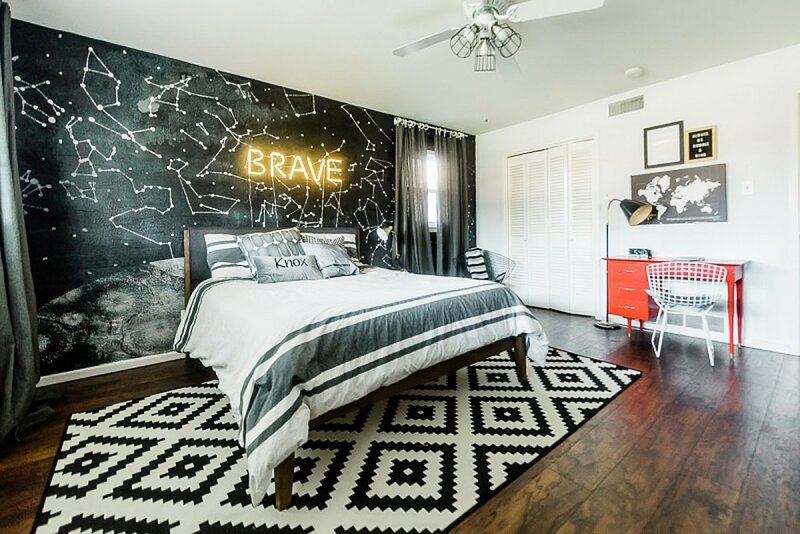 I’ve been promising Knox (our 8 year old son) that I would redo his room for over a year now and have finally, finally finished it. He has been so patient! This room was previously painted a mint green with a mashup of furniture and an overflow of toys. So, we took the opportunity to do an all-out cleanup and make some bolder design choices that would take him from little boy room and still be appropriate for a teenager. Knox loves Star Wars and science, as well as maps and travel, so I thought this constellation design I created for a Minted wall mural challenge would work really well for his room. Knowing that it was mostly black/dark, I painted the other 3 walls of his room white. I was really impressed with the quality of the new mid-century style bed we bought from Walmart. I love the upholstered headboard and the tapered legs. I’ve had a red mid-century desk for many years I couldn’t bear to part with, and it worked really well in this room. The wire Knoll Bertoia Chair was a $5 garage sale find (which is crazy- these retail for $832 new- no kidding!). Knox got the projector clock for Christmas. Above his desk are his life verse framed, a letterboard with a gold frame, and a map. I like to keep an eclectic feel to our house and don’t like all the furniture to match, so I pulled in a wood side table with hairpin legs I already had and a wire Bertoia diamond chair (another crazy Craigslist find!). Once we got the bed in place, I knew I still wanted to put some focal point above his bed. I found these “neon” letters on Amazon (link below) and Knox thought they were super cool. They are really LED lights and are lightweight so they are easily hung. They do have wires that extend from them for the battery or USB plugin, but I found a USB connector that allowed me to connect all 5 letters to a hub so we can plug them into an outlet and not use up a ton of batteries. We chose the word BRAVE because this is Knox’s focus word. This post explains what a prayer word is and why it is so special to us and him! The ceiling fan was a much-needed and simple update, and I still think I might take the whole thing down at some point and paint it all black, but it was nice to get rid of the frilly lamp cages, and replace them with these industrial ones I found. A quick $20 fix! Knox’s old bed had storage in the bottom, so I knew when we got rid of it, we would need another storage solution. My mom (who is a pro estate-saler) found this mid-century dresser for him quite a while ago, and so I dreamed up some shelving to go around it. Thankfully, Shawn was up for the job! It was a fairly easy D.I.Y.- we followed the outline of this tutorial. I did have to search all over town to find bracketing that was already painted black, and I’m so glad I did! After checking Lowes and Home Depot, it was True Value that had it. It was 1/2 the price of the white and grey versions I had seen AND I didn’t have to spray paint it. We bought the wood at Lowe’s and stained it, and then just put it together. I think the whole shelf project was around $200. Another big project was getting all of Knox’s toys organized and contained into the storage boxes you see on the shelves. I basically sat everything out on his bed and said, “everything needs to fit in these 4 boxes, and if it doesn’t, it’s being donated”- which actually worked! We did use an old cube bookshelf you can see on the floor next to the dresser for some stuffed animals/robots, but everything else is contained on the shelving! One solution I was particularly proud of was the use of these magazine files for softcover books. Since the books couldn’t stand up on their own, and I didn’t want to stack them on top of each other, this was a great solution. I found these cute gold ones and thought they were perfect! I love the way his room looks as it gets darker outside. The letters glow and the constellations seem to as well. I typically like light-and-bright but this dark-ish room makes me just as happy, and I really feel like Knox will be able to use this room for many years. Let’s talk about the wall mural! I created the wall mural using engineering prints, which you can get at local print shops like FedEx Office, Staples or Office Depot. This is the 3rd or 4th time I have used this technique, and so I decided to film the process and make it a Skillshare class! So, if you have a Skillshare account, you can go watch and learn- or use this link to get 2 months for free- which is more than enough time to watch the whole class. March seems like a funny time to be sharing about a vacation we took last July, but I also know that it’s that time of year to start planning vacation for next summer! 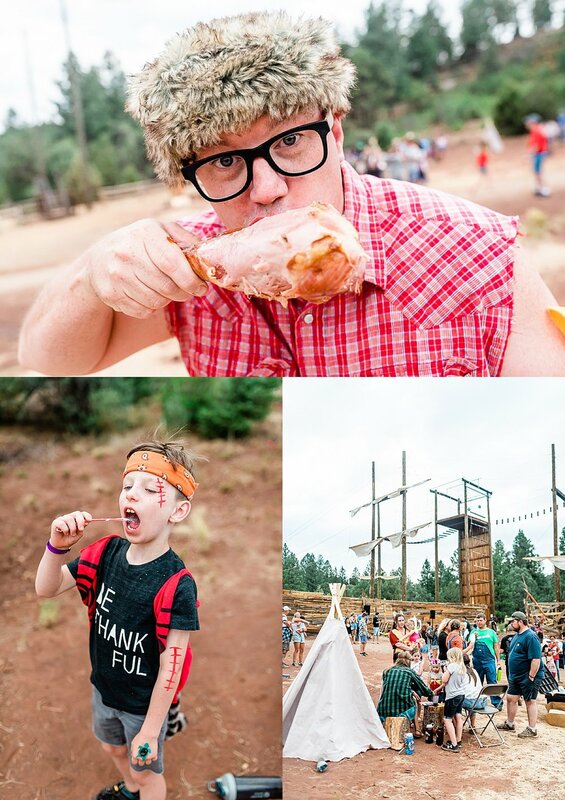 So, I’m sharing our third-year experience at Glorieta Family Camp today! We weren’t sure if we’d be able to make it to camp this year with our adoption being completed- but once we realized we’d be home from China at the end of April, we were able to decide whether or not we’d be able to go. I was worried about family camp disrupting Lucy’s transition to her new home, but in retrospect I think it only helped. More on this in a minute. 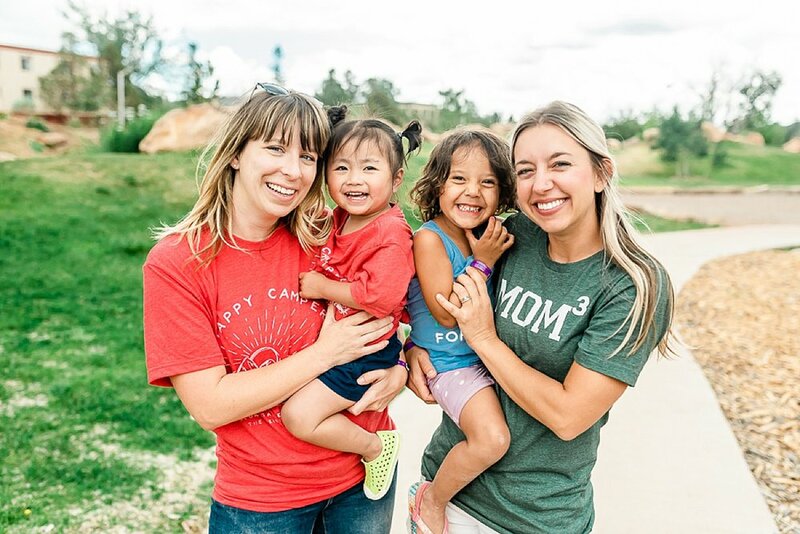 If you haven’t read my first blog post on Why We Love Family Camp, go read! <- This post will give you the main HUGE reasons we love camp. 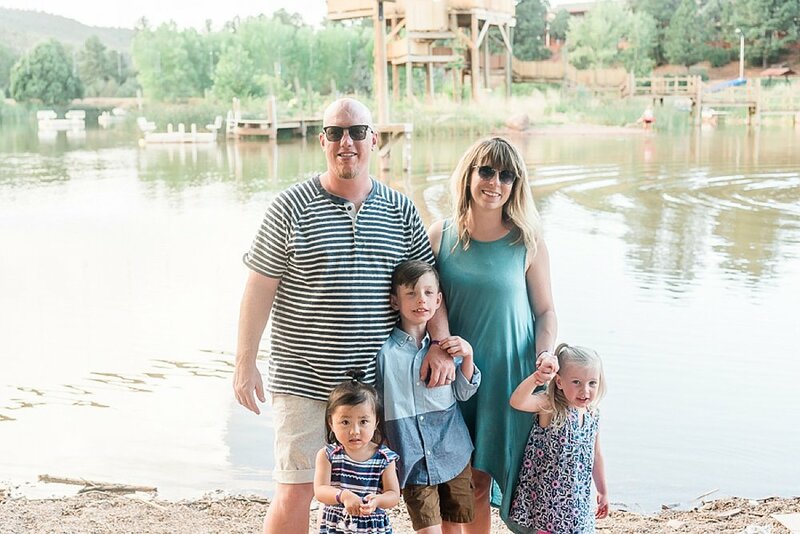 We have attended family camp in Glorieta, New Mexico for 3 years now. It’s a specialized camp for families that really caters to all ages, including the parents. This year at camp, our family jumped right in, literally and figuratively. There were some fun new elements, and some of the things we’ve enjoyed every year. One of the first activities we did was the arbor climb- and I was so proud of Knox, who volunteered to go first and killed it climbing up the tree! The girls were more interested in the little ziplines they had made nearby, so everyone was entertained and it was a fun time. At every activity, there are camp counselors who are trained in the safety practices necessary, and so we really got to relax and just enjoy the beautiful setting and our kids. One of the things I mentioned earlier was Lucy’s transition and our fear that family camp would interrupt her newly-forming attachment to us. In all reality, I think it only helped. Because we attended camp with several families from our church, it was like a week-long “get to know you” session for Lucy. Many of the older kids were (and still are!) so great with our kiddos, and being at camp really gave them lots of playtime. I vastly underestimated how important it is for our children to know other kids older and younger- it has been so amazing to see them connect throughout the week when we see them at church and beyond. Because of these familiar faces, I was much more confident taking Lucy to church (and leaving her in childcare) those first few weeks. We are so, so thankful to the kids and families that helped us establish a safe place of community from the get-go. Mealtimes at family camp are always fun (and the food is actually good!). One afternoon, we had a make-your-own-family pizza time where we all got to select the “ingredients” we wanted on our pizza. Of course, we were encouraged to talk about the things our pepperonis and such stood for- like being people with great integrity, gratefulness, and generosity. It was a great activity that kept the kids engaged and the pizza was good, too! A few years ago, Shawn and I established a no-nag rule at mealtime on vacation, and it is the best thing ever! At home, we are constantly begging for our kids to take “one more bite”, and it is such a relief to have a week where we worry zero about how much food they are eating. The amount of exercise and fresh air they are getting almost guarantees they will be hungry, and food is available almost all the time at camp- plus I keep a good stash of granola bars in our room just to satisfy hungry tummies. There are several meals that we get to do kid-free, too- which is always nice! This year, we had a speed-dating style meet and greet with the other parents before dinner which included some delicious appetizers (bruschetta! hummus! tiny skewers!). And date night is always fun. Here is our group of friends from last year- so thankful for these people! On date night, we were given a couple of hours to rest or get ready (our kids were off having a party of their own), and then we were driven to a really neat old farmhouse where we were served a delicious steak dinner. It was a great time and we were encouraged to take a walk or wander around after dinner. Such a highlight. 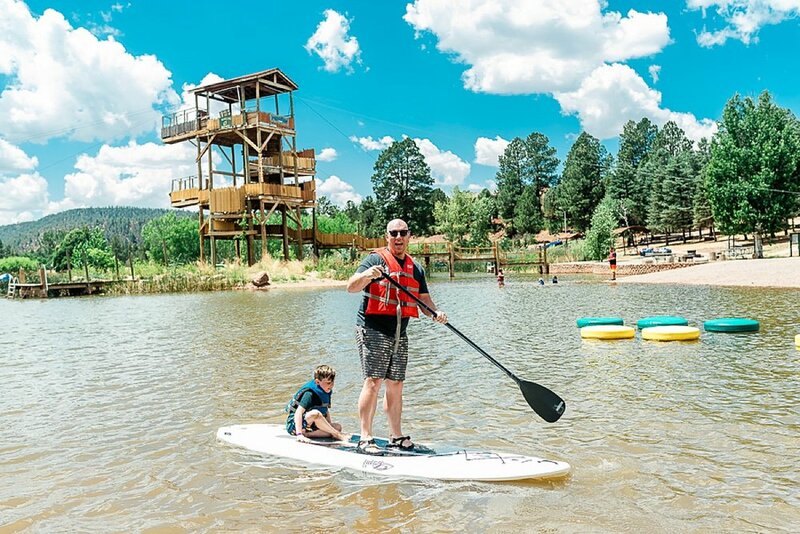 There is a lake at the Glorieta campus (pictured above) with a ton of activities like stand up paddle board, kayak and canoes, and big inflatables. Since our kids are smaller, they mostly loved looking for crawdads. An impromptu tea party with our friend Analeigh. Again, we love the flexibility of the schedule at family camp. There is no one expecting you to be anywhere, and that relives such stress and allows for fun little moments like this. Let’s talk about theme nights! Every year, there are a couple of theme nights which you are given in advance so you can bring outfits/costumes. The first this year was “Yacht Party”. So we got a little bit nautical-fancy (for camp, anyway! ), and headed to dinner. After we ate yet another delicious meal, they gave us our task for the evening- create a boat out of cardboard. Oh, and one member of our family had to try to float in it. So we got to working and taping, and Knox was volunteered as the captain of our ship. :) After we all made our “boats” we headed down to the lake to see if any would float! Haha, ours didn’t last long but it was fun. The other theme night was “Lost Boys”. 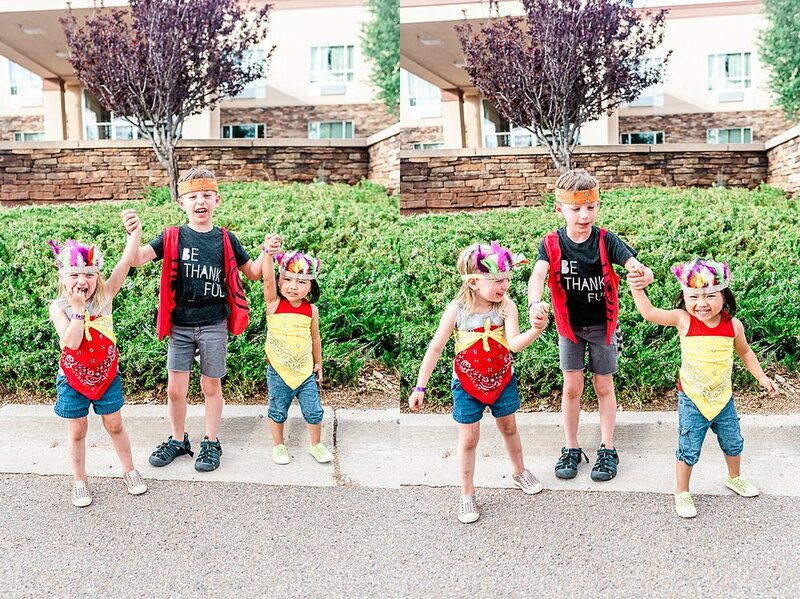 I was determined to make costumes from things we already had at home and really loved what we ended up looking like! On this night, we were driven to a whole new part of campus to find a giant wooden ship, inflatables, slingshots, face painting, cotton candy, grilled corn and turkey legs, and of course, there was a dance party. It was a really fun time. Liv was living her best life at the face-painting station. She still talks about it to this day! 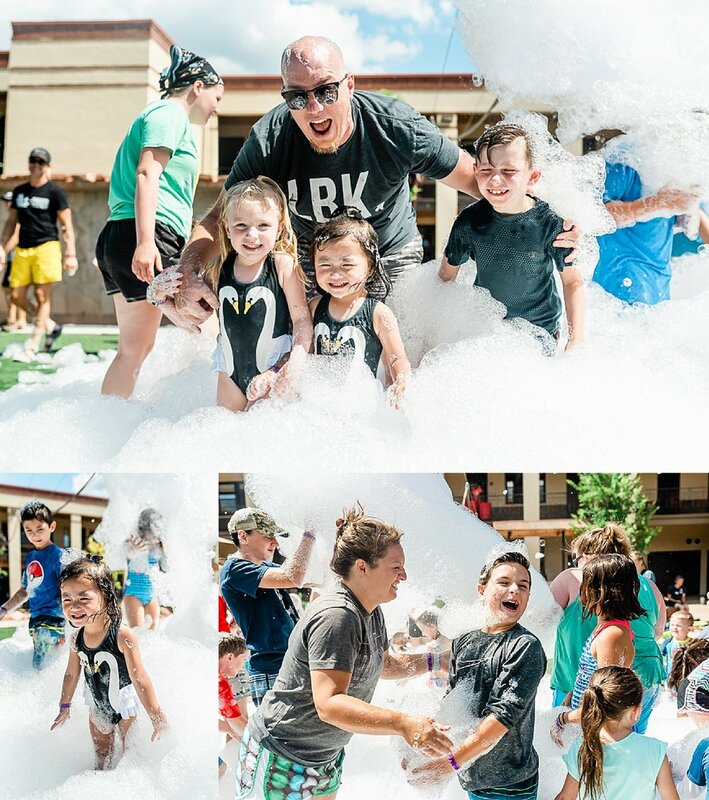 Another thing our kids have talked about consistently since was the foam party! This was a surprise to us, but so much fun! 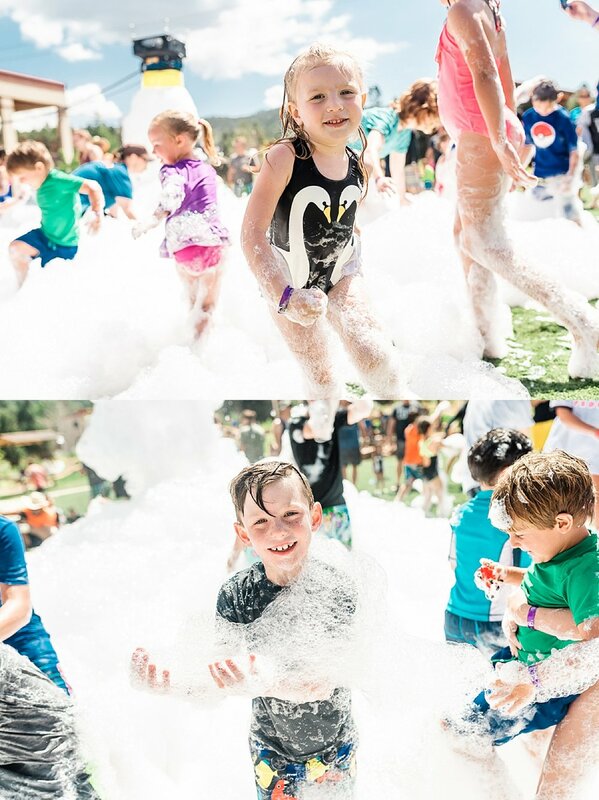 One afternoon, they busted out these giant foam makers- it was quite literally good clean fun! Camp this year was a blast and we are so thankful we got to do it again. There are so many HUGE perks I didn’t mention here, so if you are interested in going, please read my previous post. The time we had together as a family to make memories, worship together and just rest was wonderful. Shawn and I had many great conversations and vision-casting for the Anglin crew, and time to enjoy our friends who support us so much without the distractions of everyday life was invaluable. I will never forget taking this photo below- this is one of my oldest friends and her daughter, whom they adopted in the past year. 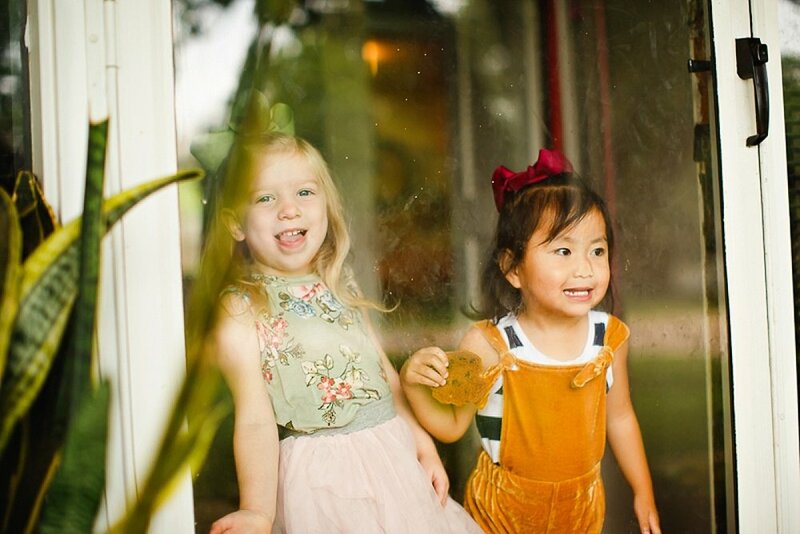 We had similar adoption timelines and so seeing these two beauties there with us was evidence of the miracles God has done! So it's been far too long since my last post- but not for lack of content! 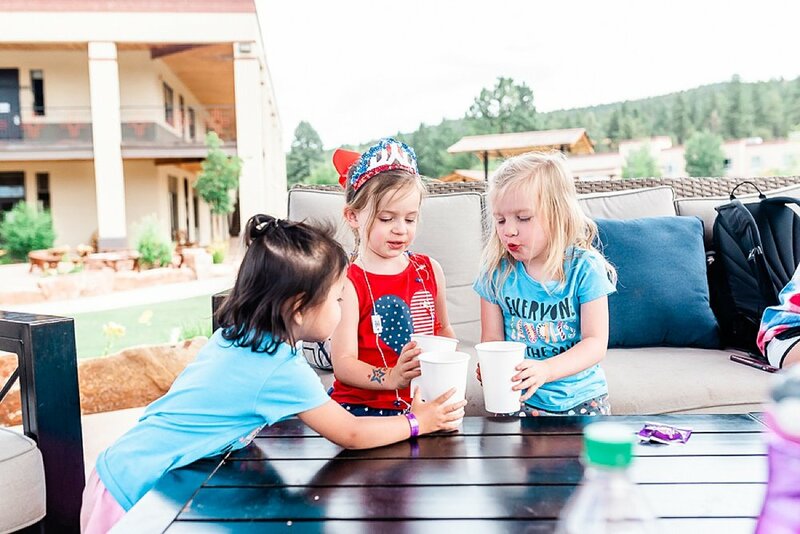 In the past month, we've spent two weeks in the mountains of New Mexico (one was family camp at Glorieta- that post is coming soon! ), delivered 3 gorgeous weddings to newlyweds, and road tripped to Galveston where we boarded a 5 day cruise to Cozumel and Progreso. We all had a blast on the cruise and Shawn and I deemed it an overall success, with a few stressful moments thrown in there for good measure (because it's not a real family vacation if there aren't a few screaming toddlers). This was our 2nd Carnival cruise- our first was when Knox was under a year old, so this one included 2 more kids and required a lot more of us as parents. We were aboard the Carnival Valor which made port in Cozumel, Mexico and Progreso which is on the Yucatan peninsula. We traveled with my parents and my youngest sister, brother-in-law, and my niece who is 17 months. It was extremely helpful to have extra adults willing to help feed a kid or take them for a walk if they were getting restless! • Book your excursions! We waited until a couple of weeks before we left to do this and we almost missed out, because some fill up fast. In Cozumel, we'd selected a "beach" excursion that included lunch and a sea lion show. While the property was nice (Chakanaab), the time it took to actually get on the beach (after a bus ride and tour of the property) was way too long, and once we finally got there, it was densely populated. Plus, the restaurant and bar with our included meals was quite a walk- making it tough to watch kids and eat. Progreso, on the other hand, was surprisingly great. We'd been warned there was a 40 minute bus ride both ways to the resort where the beach was, but that turned out to be a great nap time/applying sunscreen time for our kids. We ended up at Hotel Reef where the beach was beautiful and not too crowded. There were several food stations with delicious Mexican dishes and waiters who were very friendly and efficient at bringing drinks. After hanging out at the beach most of the day, we got in one of several pools to wash the sand off and swim before it was time to get back to the bus. • Get passports for everyone. No, you don't necessarily need passports for kids while traveling on a cruise (birth certificates will work), but it sure does make getting trough security easier. Plus, now you can easily travel with your kids anywhere! We had to jump through some hoops to get Lucy's passport (she still doesn't have a Social Security Number! ), but thankfully it came in time and was a lot more convenient than hauling around her original adoption decree. • Download the Carnival App (if you're cruising on Carnival) The app is great and not only lets you see what's going on around the ship, but is the best way to communicate with your group. The chat function is $5 per device and worked pretty well for us. There were a few quirks- like keeping the app running so you don't miss messages- but overall it was great. • Download music, videos or apps for any devices. Unless you pay for service on the ship, you won't be able to access any of your normal apps, etc. We chose to not bring the kids' iPads on the ship, but it was really handy to have our normal bedtime playlist downloaded when it was time to put kids to bed. This is our room- with kids in bed. Liv and Lucy are in the upper left bed (you can see I wedged lifejackets between the bed and the wall because I was worried someone would wiggle out and get stuck- haha) and Knox is in the upper right. It was a little crazy, but our bed was very comfortable! • Don’t fall for the soda upgrade. Sodas aren't included in your cruise price, and in the weeks before you go alcohol and soda packages are heavily marketed via email. We really expected to be dealing with children begging for Sprite (we don't usually have it at home but do allow it on vacation), BUT they never even asked about it because there are several delicious juices and milk available at all times for free. • Check your phone plan. Most companies include Mexico and Canada free (turn on service while at port). This is a great time to check for important texts/emails for free without paying for the pricey-yet-slow internet on the ship. • Make a daily budget. We set a budget for ourselves every day and it really helped us enjoy the cruise and not stress out over money constantly. You will need to budget $65-70 per person in gratuities (no, it's not optional). This will hit your account the last full day- read up on this before you leave so it's not a surprise. • Call a few weeks before the cruise for free upgrades. We did this the first time we cruised as a family, and my sister did it this time with the same result. She'd called Carnival to check about cribs (yes, they provide them), and they offered her a free room upgrade since there were available rooms and it was close to the sail date. Wish we would have given it a shot this go-round! • Kids' arm and chest floaties. We have these PuddleJumpers and this Speedo one (this one is great for Lucy since it has shoulder straps- the others tend to slide down on her). They provide lifejackets on the ship, but we utilized the kids' floaties in port as well. They were really nice to have on the beach- especially since the girls wanted to play in the sand and wade in the water a bit. • Peppermint oil for nausea. I used this a ton while I was pregnant, and it still works for me (not pregnant!). Simply inhale it or apply it to your chest with some carrier oil, like coconut oil. • Swim diapers AND a reusable swim diaper (like this one). We did not know prior to the first morning that there are NO DIAPERS ALLOWED- NOT EVEN SWIM DIAPERS in the ship's swimming pools. We were lucky that Lucy is close to being potty-trained and just took her swim diaper off- but this rule is strictly enforced by some lifeguards (not-so-strictly by others). If I had an infant, I would definitely bring a reusable swim diaper like the one I linked above so they can take a dip in the pool on ship days, AND disposable ones for port days. • Storage-sized Ziploc Bags. These were super handy for all sorts of things- but I was glad I had extras to keep dry clothes, sunscreen, and phones from getting sandy and wet in the beach bag. • Snacks. We stock up on Z bars and Clif bars- they are our favorite travel snack since they don't get crushed or melt easily. You really don't need many snacks (there is PLENTY of food on the ship), but these came in clutch on port days or if we were just not at a place to get kids food and needed something quick for them. My sister made a good habit of grabbing a few cereal boxes from the buffet line (the individual-sized boxes) in the morning and those were great (free!) snacks too. • No towels needed. There are plenty of beach towels provided in every stateroom, and if you need more they will bring them to you. You can take these with you to port and as long as you bring them back, it's free. You can also check out towels at the ship's pool area if you don't feel like dragging wet towels in and out of your stateroom. • Insulated cup for coffee/water. I drink coffee all day (yes, really) and there were a few times we really needed water but there was none to be found (on the beach mostly). I was so glad we'd brought our favorite insulated mugs to keep our coffee hot and our water cold. • Baby carrier or harness. Surely I am not the only mama who booked a cruise and then had a kid-goes-overboard nightmare...or two (yiiiikes!). We had this harness from when Knox was a baby and we totally used it on the ship with Lucy, who has a history of running off. I also carried Lucy in our trusty Tula carrier during embarkation, debarkation, and on the long walk on and off the ship at port. It was so nice to give her a place to rest and I loved having free hands. • Signs or decals for stateroom doors. I saw lots of people bring decals or signs to hang on their stateroom doors, and thought it was a smart idea for kids. I would avoid using anything with our names for safety reasons, but having a picture or symbol that kids could recognize could be really helpful if someone gets lost and can't find your room. • Umbrella stroller. My sister suggested this one- and I agree- a small umbrella stroller (anything larger would be too much for many of the tight spaces on the ship) would be helpful if you have a sleeping infant or one who does not like a baby carrier. • Kid's water bottles. We carry one of these for each kid pretty much everywhere we go, and they were super handy on the beach in Mexico when we weren't about to give them water from the restaurant to drink. We filled these each morning in the ship's restaurant with ice and water. • Travel-size dish soap and small dish brush. This is just one of my travel norms that has paid off many times. We use them to wash our water bottles and mugs, and have even treated stains in clothing with it. • Card games, wiki stix, board games. The last day of the cruise we busted out some fun goodies that my mom had brought for the kids and just hung out in the restaurant- out of the hot sun. The kids loved playing with wikki stix and some modeling clay. I saw several families playing card games or board games, too. • Cheap flip flops. To keep from overpacking, I try to keep it to 2 pairs of shoes per person. After this trip, I'm adding cheap flip flops to that rule. During our last day at port, Knox's shoes went missing. We're not sure if they were stolen or just buried deep in the sand, but either way, we left without them. I was glad he had another pair of shoes to wear, but wished I would have brought some cheap flip flops to take to the beach/pool since he didn't want to wear swim shoes. • Silicone wedding ring. These are inexpensive and worth using instead of your actual wedding ring. Please, listen to the girl that lost a diamond while ziplining in Puerto Rico (thank goodness for that warranty!). I have these rings. • Tampons/Feminine Products. Trust me, you don't want to have to buy these in Mexico (sketchy) or on the ship (super expensive). • Probiotics. Just to keep everything regular while you binge. I use Young Living probiotics for myself and heard they just came out with kids' gummies! You're welcome. • Bucket/Shovel for playing in the sand. Our kids played in the sand 90% of the time we were at the beach and even used them at the pool on the ship. These were a little annoying to carry around, but worth the few dollars we paid for them for the amount of entertainment they provided. • There are lots of freebies! Check the daily schedule to see what is being offered that day, and even if it sounds a little lame, show up. We had a ton of fun at the trivia games and shows. There were cooking demonstrations and art and jewelry presentations (that boasted free champagne!). They even had a Dr. Seuss parade for the kids. All free! • Take advantage of the childcare. Truthfully, I intended to snub the childcare on the ship, assuming it was a sad, lonely place full of disgruntled workers (sorry, my mom-judgement is harsh sometimes), BUT when we boarded the ship, they told us we needed to go register the kids whether or not we were planning to utilize the childcare area and services. I was totally surprised to see a very cool, clean, brightly colored space with an underwater theme and friendly workers. They walked us through the facilities and their procedures- which were very safe, clean, and totally age appropriate for our kids and told us that anytime we had kids there that we'd be given a phone that they could use to reach us. We ended up taking the kids almost every day because they enjoyed it so much- and they even ate most of their dinners with the childcare program (called "Camp Ocean"), which meant we got to have a peaceful, adult dinner every night. They served kid-friendly food our kids loved- and the same childcare workers were there every day, actively involved with them. This was a major win in our book! • Hit up the pool first thing in the morning to snag the good chairs! This may seem silly, but trust me, it will pay off about 1:00 P.M. when the pool is packed and you still have a prime spot in the shade to watch your littles while you drink your piña colada. • FREE Room Service! I'm usually too cheap to order room service during hotel stays, but Carnival offered free room service until 10 PM to staterooms (you can get it for a small fee after hours as well). There were actually door tags in our room where we could order what we'd like for the next morning. We were able to select what we wanted delivered, pick a delivery time and set it on our door before 10 PM. Then amazingly, the next morning we had hot coffee delivered for us and bananas to tide hungry kids over until we made it to breakfast. • Don’t stress about what your kids are eating/not eating. This is one vacation rule I've adapted this summer and it has been a great thing for my mindset. We battle "how many more bites" from at least 1 kid at almost every meal, and it wears on Shawn and I both. Since food is readily available 24 hours of the day on a cruise, we chose to just not worry about what- or more importantly how much- our kids were eating. No, they didn't just eat ice cream the whole time- but we definitely had it for breakfast on the last day! • Keep bedtime routine. Our kids were exhausted every night, but somehow when their heads hit the pillow, they still wanted their normal bedtime music. We had downloaded our bedtime music playlist on Spotify and brought our bluetooth speaker which were really handy. • Unpack when you get there. Like I said, our room was TIGHT. I unpacked all our suitcases and utilized the drawers, cabinets, and shelves in bathroom. It made getting ready and keeping the room organized much easier. I laid kids' clothes out paired in outfits and made a shoe drawer the kids could throw their shoes in. We hung a giant laundry bag (purchased at Ikea) in one of the closets and all dirty clothes went there. When it was time to pack up, I just filled one suitcase full of dirty laundry and it was so nice to just dump it in the laundry when we got home. • Cash is king. You need cash for tips and spending. Yes, many stores will take cards, but if you take an excursion you will need cash for tips. • Keep passports with you always. Never, ever leave your passports on the ship while in another country. Yes, it may be annoying to keep them safe in your beach bag, but you do not want to have an emergency in another country and have no identification. Just a biiiiiit windy on the top deck! Yikes, I hope that was helpful- because it ended up being super long. I'm just writing the blog post I really wanted to find before we headed out. Happy cruising! My mom bought the girls these sweet dresses in Mexico so we had a very quick photoshoot. There were 4 other adults watching to make sure no one got too close to the rails and about 186753 outtakes, haha!